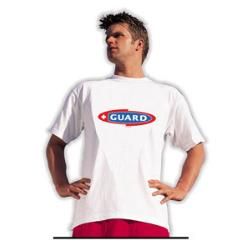 Lifeguard t-shirts keep your guards cool and protected. While female lifeguards have greater coverage with their suits, men and some women desire something that will cover them a bit more while they sit in the sun and keep an eye on the water. With the use of lifeguard t-shirts, you will be able to obtain the additional coverage you would like, while still showing everyone you are the person to go to when they need help on the beach or at the pool. Choose from one of several different t-shirts that feature the lifeguard logo on them. The white Speedo Guard T-Shirt may seem like a plain option, but it is a good one to provide you with greater coverage in the sun and to let people know you are the lifeguard on duty. The shirt is made from 100 percent cotton for breathability and is tagless so you don’t have to worry about an irritating tag that will leave you spending more time itching. To let everyone know you are the guard, the word “guard” and the cross logo are printed across the chest of the t-shirt in a bold red that will really stand out. The Speedo logo is featured on the sleeve as well. If you are looking for something a little different so you can stand out even more, choose the Guard T-Shirt. This 100 percent cotton t-shirt features a fun guard logo on the front that is in both red and blue to help it stand out even further. This shirt is a great option if you are looking to save money on your guard t-shirt, while still having a durable shirt that will last a long time and suit your purposes. Some lifeguards are concerned with the possibility of getting their t-shirt wet. This is why you can also choose the Guard Quick Dry Tech Tee. This shirt is made from breathable polyester that will dry quickly if you don’t have enough time to remove the shirt before you enter the water. The shirt also wicks any sweat away, making it more comfortable to wear out in the hot sun all day long, along with UV protection. Finding the right lifeguard t-shirts is essential to ensure your guards are comfortable, are protected from the sun and can do their job well. With all the choices available, you will be able to find the perfect option for all your guards. 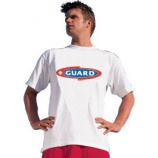 Lifeguard t-shirts can provide your guards with the coverage they need while staying cool. Everyone knows it isn’t a good thing to be out in the sun, fully exposed. The more skin you have exposed, the more sunscreen you will need and the greater the risk of excessive exposure to the sun. When you are a lifeguard, you need to be out in the sun for your entire shift. You may have an umbrella to offer you a little protection from the sun, but for the most part, you are out in the open. Therefore, it is important to cover up as much as possible. This includes wearing the best guard tee to help protect your upper body. This option for the best lifeguard t-shirts can help your lifeguards stay cool and dry throughout the day in the hot sun. This t-shirt is made from 100 percent polyester and offers a lightweight option for lifeguards who are looking for a little reprieve from the heat of the summer sun. The material is completely breathable so you don’t need to worry about feeling as though you are sweltering in the sun from wearing too much clothes. These shirts also offer UV protection, helping your sunscreen do its job. With the lifeguard logo, everyone will know you are the one to come to for help. If you are looking for the best guard t-shirts and want something that can be worn on a regular basis in addition to at the pool or beach, a guard t-shirt can be just what you need. Emblazoned with a lifeguard logo that shows you are in charge, this 100 percent cotton t-shirt provides lightweight comfort and the ability to wear this t-shirt anywhere. If you want to have more than one shirt or have offered to buy shirts for all of the lifeguards you employ, this option offers a low cost so you don’t need to worry about the price. Choosing the best guard tees for your team of lifeguards comes down to two basic choices. If you want something that will help keep your crew cooler, the quick dry tech t-shirt can provide breathability and comfort for those long hours in the sun. However, if you want something that costs a little less but still provides the best coverage for your guards, the cotton guard t-shirt can be the right option for you. No matter which one you choose, your guards will have a t-shirt that shows everyone on the beach who to trust.